With careful monitoring and a vaccination campaign, Catalina Island’s tiny foxes are steadily recovering. It took just one raccoon to bring down an island full of foxes. When researchers realized that foxes on Catalina Island, California, were dying of canine distemper virus (CDV), they first laid the blame on domestic dogs. But eventually, subtle genetic differences in the disease virus led them to realize that the true culprit was a masked bandit, an invader from the mainland. Raccoons aren’t native to Catalina Island, yet one of them wound up there anyway, perhaps as a stowaway on a boat. The foxes’ immune systems were completely unprepared for the virus and they were nearly wiped out. In 1999, a survey indicated that across the Channel Islands, including Catalina, the populations of the distinct island fox had declined by 90 to 95 percent. On Catalina, there were just 103 foxes left, down from 1,342 just five years earlier—their population wracked by CDV. On three of the northern Channel Islands, foxes weren’t dying from CDV, but instead were being hammered by golden eagle predation. Biologists at the time estimated that the fox populations on the majority of the Channel Islands had a 50 percent chance of being wiped out over the next five to ten years. That didn’t happen, but as I stand on Catalina Island on a beautiful November morning, wildlife biologist Julie King shows me just how much it’s taken to keep that from happening. As we talk, King leans over and pulls one of the diminutive foxes out of a trap. Roughly the size of a house cat, island foxes are the smallest—and most adorable—foxes in North America. Though they weigh less than three kilograms, the foxes are the islands’ largest native mammalian predators. King takes a large needle and gently places it against the fox’s neck. With a practiced hand, she depresses the plunger, and a small radio transponder slides through the hollow tube into the skin beneath the animal’s scruff. It barely whimpers. This chip is just like the ones used for domestic dogs, but this fox is no pet in danger of running away or getting lost. Foxes first came to six of California’s eight Channel Islands between 7,100 and 9,200 years ago, though how they did so is a mystery. Perhaps a handful of gray foxes rafted over from the mainland aboard trees uprooted during a coastal storm, or maybe indigenous people brought them over as pets, or as sources of food. Regardless of how they arrived, the then-invasive grey foxes made the most of island life. They had no natural predators, and plenty of skunks and mice to eat. Over time, the foxes evolved, became smaller, and developed into a distinct species: the island fox. On each of the six Channel Islands they now call home, the foxes further subdivided. Like Darwin’s finches, each island has its own subspecies—capable of interbreeding, yet adapted to its own little habitat. Because of their declining populations, four of the subspecies (from San Miguel, Santa Rosa, Santa Cruz, and Catalina Island) were added to the US Endangered Species Act in 2004. And King, the director of conservation and wildlife management for the Catalina Island Conservancy, is responsible for monitoring the foxes and spends six weeks each year trapping them. King tells me that most of the foxes get a rabies vaccine and a CDV vaccine. But this one, she says holding up the fox she grabbed from the trap, will be a disease sentinel—he won’t get the vaccines. When he dies he’ll stop moving, and his radio collar will tell King where to find his body. A necropsy will show if there’s another infectious disease sweeping through the island. Later in the afternoon, wildlife biologist Tyler Dvorak patiently sorts the blood samples collected from the trapped foxes in the Conservancy’s island laboratory. The foxes’ red blood cells will yield genetic information about the foxes’ evolution, while tests on their blood serum will allow researchers to understand whether and how the vaccines are working. Some of the samples will remain in cold storage, to help answer questions that researchers have yet to ask. In a way, the so-called Galapagos Islands of North America have become a living laboratory for conservation biology, and home once again to several thousand of the planet’s most adorable foxes. Jason G. Goldman is a science journalist based in Los Angeles, California. He writes about wildlife, ecology, and conservation for Scientific American, BBC, National Geographic, BioGraphic Magazine, and elsewhere. He was editor of The Open Laboratory 2010: The Best of Science Writing on the Web and is coeditor of Science Blogging: The Essential Guide. 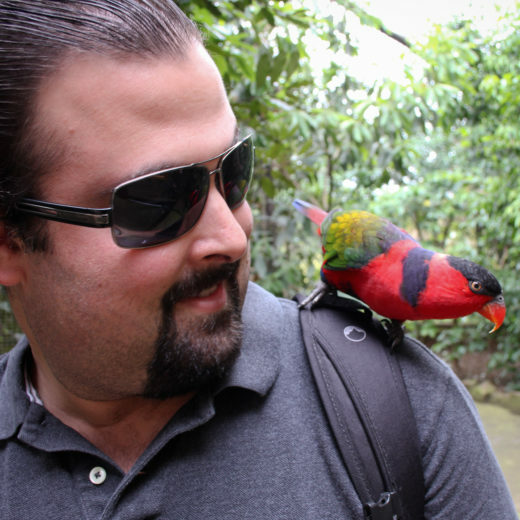 He also leads ecotourism expeditions in collaboration with Atlas Obscura, and is cofounder and director of SciCommCamp. 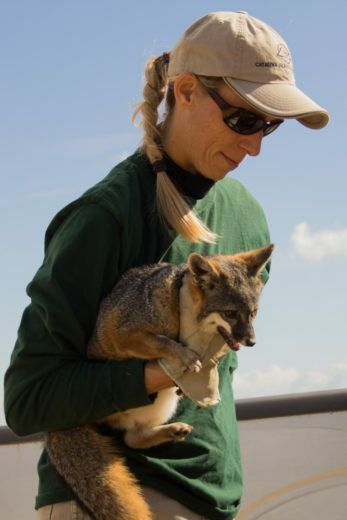 Cite this Article: Jason G. Goldman “A Sacrifice for the Catalina Foxes,” Hakai Magazine, Dec 10, 2015, accessed April 26th, 2019, https://www.hakaimagazine.com/news/sacrifice-catalina-foxes/. Before Europeans arrived, California’s Santa Cruz Island was an economic powerhouse for the Chumash people. Ecotourism threatens the cute and cuddly quokkas isolated on an island in the Indian Ocean.